The holidays fill just about everyone with a sense of wonder and excitement. Some of us, though, are also filled with anxiety about entertaining, gift-shopping and wrapping, expenses and other unavoidable “joys” of the season. If you get a little overwhelmed heading into the holidays, we have some simple hacks that will save you time and money…so you can focus on being merry! Food. Cooking can ruin any host’s or hostess’s holiday; by the time guests arrive you’re ready for bed! Here are some celebration-worthy recipes that look and taste special but take next to no time at all – and require just 3 ingredients (courtesy of buzzfeed.com): Genius 3-Ingredient Recipes. Note: If you make the Nutella® Brownies, be prepared to share the recipe with guests! Serving pieces. Many apartment residents don’t have the variety of serving pieces to accommodate all the great food required of holiday gatherings. Everything from hors d’oeuvres to main dishes, sides and desserts can be served from a clean cutting board covered in colored plastic wrap, or a cookie sheet covered with colored aluminum foil (colored, food-safe foil is available at craft stores). A pretty framed mirror laid flat on the table works great, too, and adds a little sparkle by reflecting the light of candles. Crisscross two burlap runners, one lengthwise and one width-wise, on your table (burlap is cheap and available at most craft stores); arrange battery-operated votive candles in wide-mouth stemmed wine glasses lengthwise on your table or in a circle if your table is round. Add a couple artificial pumpkins for Thanksgiving or an assortment of holiday ornaments and you’re set! Gift wrapping. Each year in the U.S., 4 million tons of logs are used to make wrapping paper and holiday shopping bags, according to the Clean Air Council. Instead of loading up our landfills, place gifts in containers that then also become a gift, like a decorative wicker basket or fabric-covered organizer box. If you can’t do without the sound of paper being ripped off gifts, Kraft paper is a cost-effective alternative you can easily dress up with a tinsel garland ribbon or holiday-themed Washi tape. Ribbons and bows. 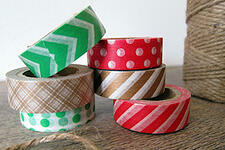 Instead of ribbon, tie packages with plain ol’ twine from the hardware store, or colored twine from a hobby store. 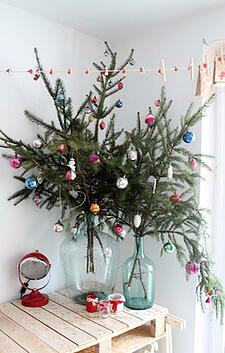 Then attach pine greenery, twigs, pinecones, or an ornament. Holiday tree. Avoid the cost and hassle of a tree by purchasing some quality artificial pine greens (you’ll find a variety at your local craft store) and placing them in a heavy, wide-based vase to prevent tipping. 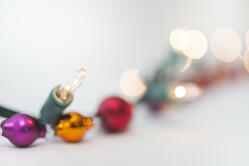 Now decorate with small ornaments, a homemade construction paper garland and a string of indoor lights. Here’s another tree substitute that adds real drama and can be reused each year. Find an old window screen at a local salvage yard; after cleaning it thoroughly, attach ornaments by their hooks to the screen in the shape of a tree (use only lightweight ornaments). Now lean the finished tree up against the wall on a table (use felt self-sticking tabs on the back of the screen to avoid damage to the wall). Find instructions here. Tree skirt. The two ideas above require no tree skirt, but you’ll want one if you’re going to put up an artificial tree…but these can run you anywhere from $45 to over $100! Make a DIY version by wrapping a clean white sheet loosely around the base, then sprinkle liberally with silver snowflake sequins. Another inexpensive option is to look for clearance holiday tablecloths; square or round work best but oblong works, too. Cut a hole in the center, then cut a line from the circle directly to an outer edge, allowing you to wrap the skirt around the base of the tree. We’d love to hear from anyone with helpful holiday tips that make your celebrations a little more festive – and a lot less stressful. What tips do you have that other residents could use in the coming weeks?